Take in the views of Quandary Peak from this beautiful . 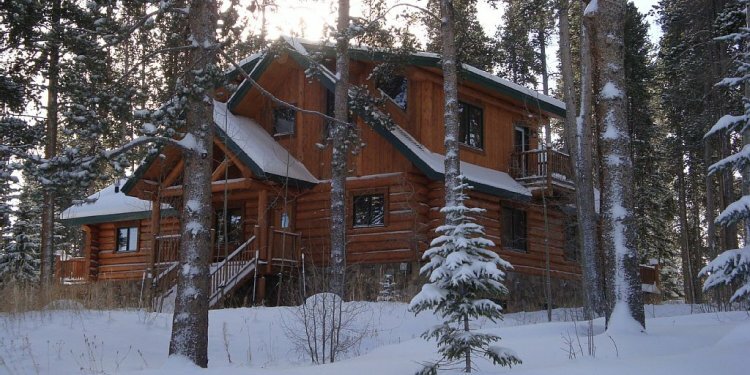 Its log cabin style creates a relaxing getaway when you next visit the Colorado Rockies! This home is a great location for visitors looking for year-round mountain recreation. It is located about eight miles south of downtown Breckenridge, and just nine miles away from the slopes of Breckenridge Ski Resort. It's roughly 26 miles to both A-Basin and Copper Mountain ski areas, and 45 miles to Vail. Grand in size and stunning in its construction, this lovely cabin has a classic homey feel with two floors of living space and plenty of natural light. The main living space is on the second floor with a deck looking straight out to Quandary Peak and its foothills. The views are just as good inside from the comfort of the sofa beside the gas stove. Check the snow reports via WiFi while curled in an armchair. The spacious kitchen with a vintage feel makes it easy for multiple guests to cook together while enjoying conversations with others at the dining table. During the warm months, gather for meals as a family at the outdoor banquet table, and grill up some yummy barbecue on the grill. Both tables comfortably seat eight guests. Load the dishwasher after dinner for hands-free cleaning. Downstairs is a casual den area for mid-day sports games on cable, quiet reading, or getting some work done in the office area. There's a keyboard for the musically inclined, and a second deck with forest views. This cozy den space is a great room for the kids to hang out in while the adults enjoy some wine upstairs. Up to 10 guests (eight adults maximum, please) will sleep comfortably in four bedrooms and two and a half bathrooms. One of the bedrooms is a loft above the garage offering a bit more privacy with two sets of twin-over-double bunk style beds. In the main house there is one room with two twin-size beds, and two more rooms with a queen-size bed in each. All of the bedrooms welcome sleepy visitors with rustic charm and warm quilts. This home is well-equipped for a group of friends and couples, or a family with kids traveling together.